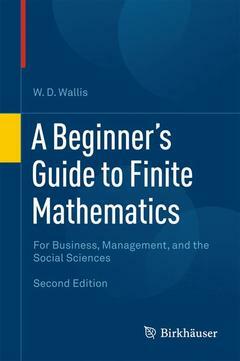 A Beginner's Guide to Finite Mathematics Wallis W.D. This second edition of A Beginner’s Guide to Finite Mathematics takes a distinctly applied approach to finite mathematics at the freshman and sophomore level. Topics are presented sequentially: the book opens with a brief review of sets and numbers, followed by an introduction to data sets, histograms, means and medians. Counting techniques and the Binomial Theorem are covered, which provides the foundation for elementary probability theory; this, in turn, leads to basic statistics. This new edition includes chapters on game theory and financial mathematics. Requiring little mathematical background beyond high school algebra, the text will be especially useful for business and liberal arts majors. Preface.- Numbers and Sets.- Counting.- Probability.- Graph Theory.- Linear Equations and Matrices.- Linear Programming.- Theory of Games.- Financial Mathematics.- Your Turn Solutions.- Answers to Exercises A.- Index.